Ventilated ceilings are designed to adapt to the specific kitchen and create the most comfortable kitchen environment. These solutions are visually appealing and ensure high hygiene levels. Ceilings may comprise of exhaust, air supply modules, as well as built-in fluorescent or LED lighting. Ventilated ceilings are made-to-measure product. Unlimited design flexibility and solid know-how in made-to-measure production allows us to process your most demanding commercial kitchen ventilation project using Nuventas as a single supplier, which allows to keep the costs down and have a complete control over the quality. Ventilated ceilings are constructed from AISI 304 stainless steel. AISI 430 option is also available. 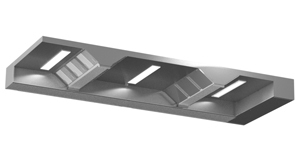 Available ventilated ceilings modules: exhaust modules, air supply modules, luminaires. The dimensions of ventilated ceilings depend upon your requirements.